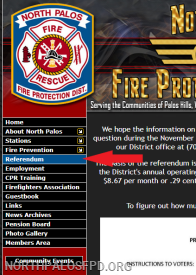 For information on the April 02, 2019 Referendum, a fact brochure, links to articles and our Tax Calculator please visit our Referendum page listed on the menu tab in the left hand column of our home page. The North Palos Fire Protection District is seeking qualified applicants for the position of Part-Time Firefighter/Paramedic. The position requires members to work 24-hour shifts with an hourly pay rate of $17.50. Members work an average of 6 to 8 shifts per month, additional shifts may be available upon approval. The North Palos Fire Protection District has an emergency board up rotation program to assist in getting emergency board up services to the scene of an incident in a quick and efficient manner. North Palos Fire Protection District Smoke Alarm Program.